Services: branding, print design, print management. “Curious delivered a top class professional service. Their creativity and skills have been an invaluable resource. 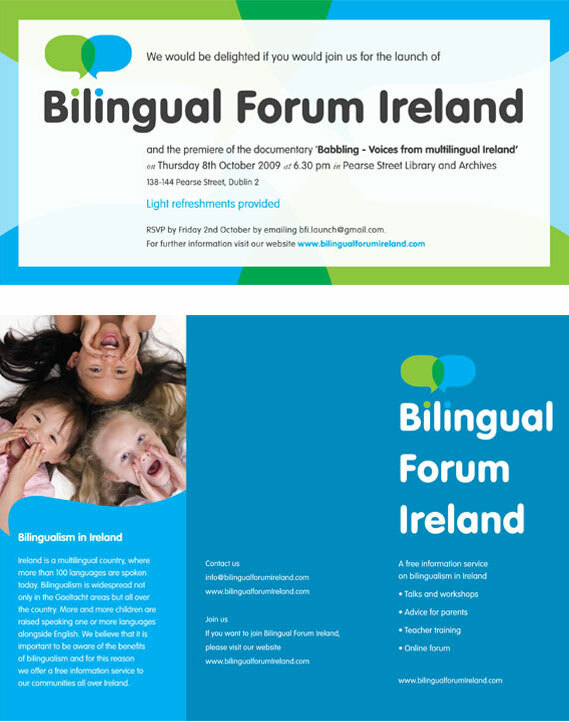 Bilingual Forum Ireland offer advice and support to parents of bilingual children in Ireland. They wanted their logo and branding to be fun and friendly but professional. We coloured the dots over the two instances of the letter i in the word bilingual and added overlapping speech bubbles to convey the idea of bilingulism and to suggest two people talking. We also produced an invitation to their launch party and a leaflet about their services.